Feeling a bit nervous to share on Facebook? Don’t worry, that's completely normal. We’ve figured out best practices, tips, tricks, and hints to ensure that sharing on Facebook is easy. There are a ton of different ways to share with your Facebook network, so choose the ones that feel right for you. We recommend starting to share right after creating your GoFundMe so the start date is fresh. If you've taken some time getting ready, that's okay. Just write to our team and we can refresh your start date for you. Sharing a Facebook post is one of the easiest ways to get the word out about your GoFundMe. You can do this by going to your Facebook account, or by writing the post directly from your GoFundMe Dashboard. It’s important to post on Facebook during a “high traffic hour,” which is the time that most of your friends and family will be scrolling through their newsfeeds. In our experience, posting your GoFundMe anywhere between 6pm-9pm Sunday- Thursday in your time zone is the “golden hour.” This is when your friends are getting off work, coming home from the gym, finishing dinner, and are ready to sit down on their couch and scroll through Facebook. While each community is different, you want to avoid posting late at night, or during a time when you know most of your friends and family are already at work. Think about your Facebook habits as a model for your community. A short message to your friends & family. Even just a “Hi!” will work. A request for them to donate/ share your GoFundMe. Wow! Thanks to all of you, we’ve raised [Insert how much you’ve raised here] in only [insert how many days here] days. I’m truly thankful for your generous support. I’m only [insert amount here] from my goal, so I kindly ask that you share my GoFundMe with your network. Each share gets me closer to my goal, so I thank you from the bottom of my heart. Remember to share your campaign consistently- as one Facebook post will not reach your entire friend group. Sharing your GoFundMe on different days each week opens you up to a larger audience! Pro Tip: Learn how to share your Facebook post with specific groups of people here. Though Facebook posts are one of the easiest ways to share your GoFundMe, Facebook messages are the most effective ways to share. In a very digital world, Facebook messages act as the “personal touch” that is often lost in social media posts written for the masses. To send a Facebook message, go to your Facebook account and select the 'Message' icon, as pictured below. Once in the message, you can add your recipient’s name, and start typing the message in the box below. You’ll know you have correctly entered your recipient’s name when the name is highlighted in a blue box. While group messages might seem easier, individual messages are the true way to show people how much your GoFundMe means to you- and how thankful you would be for their donation. When you’re writing a message to multiple people, people feel like they don’t need to donate because they think the other people in the message will. This is true for a message from three people all the way up to 300 people! Pro Tip: The more individual messages you can send, the better success you'll see. We’ve put together enough outlines and examples to ensure that you’ll feel comfortable sending anyone and everyone a Facebook message. What are you raising money for? Be as specific as possible here! Why is this important to you, and why should it be important to the person you're sending the message to? Be sure to ask for a donation at the end of the message! Though it can seem uncomfortable, people often won't feel inclined to donate unless they're specifically asked. If you don't want to ask for a donation from everyone, then be sure to ask them to share your campaign, and ask their friends and family to share as well. Check out some more Sharing Templates here. It’s important to send Facebook messages during “regular” hours, otherwise, your friend might read it in the middle of the night while half asleep! The key is to know your audience and send the message when you know they’re likely to be online and have time to look at your GoFundMe. Typically, sending messages after work from 6-8pm in your local time zone is a good rule of thumb, or on Sunday nights around the same time frame. I would try to avoid regular weekend times, as people are less likely to be on their phones/ computers! What if I Already Sent it? Don’t worry! The good news is that you can always follow up with your original message at a better time, as follow-ups are just as important as the original message. Following up 3-5 days after your message without hearing back is encouraged. You can do this through another Facebook message, text message, or even in person. The important part of the follow up is that you remind them about your GoFundMe, and share how much it would mean to you if they were able to make a donation. Remember, honesty and vulnerability are best when it comes to these things! If they can tell that you’re emotionally invested, they will be too. Facebook events are creative ways to share your GoFundMe with a large group of people, without feeling like you’re oversharing your link. Also, Facebook curates your posts to show them to a specific audience, so creating an event and inviting your closest friends and family guarantees that they see your GoFundMe and know about your story! This gives your network the opportunity to share your GoFundMe with their friends and family by inviting them to your event. Pro Tip: Raising money for a surprise where you don’t want the beneficiary to know about your GoFundMe? 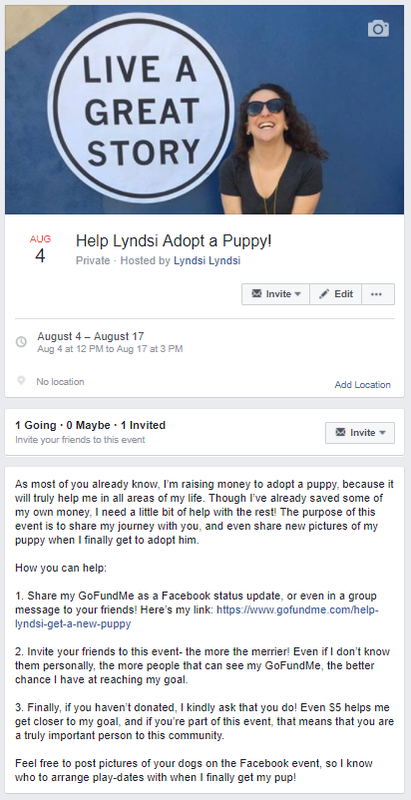 Creating a private Facebook event is a great way to share the GoFundMe, without ruining the surprise! Just be sure to remind everyone that it’s a secret, so they don’t accidentally invite the beneficiary. Your event guest list should include anyone and everyone that you want to see your GoFundMe, even if you’ve already shared it with them. The key to success is sharing it with people in as many different ways as possible, since people easily forget to donate after seeing your GoFundMe for the first time. Your acquaintances: Be sure to ask your friends to invite their friends in the event as well! That way, your event is seen across multiple social circles, and you have a higher possibility of people that you don’t know directly donating to your GoFundMe. Pro tip: There’s not an option to invite all of your Facebook friends, and that’s okay! People feel more included in events when they see your personal invitation, and a hand picked guest list. Remember, people are more likely to donate when they feel like you’re personally reaching out to them because you want their support. The key to a successful GoFundMe Facebook Event is sharing the “why” behind your event, and a summary of what you’re raising money for. To see an example, click here. Not sure how to create a Facebook event? Click here to learn how. Pro Tip: Be sure to select “Private Event” if you’re raising money for a surprise and don’t want the beneficiary to find out. After you’ve created your event and invited all of your friends, it’s important to consistently post updates to keep your supporters in the loop. Since the Facebook event is a more dedicated audience, feel free to post more frequently to remind them about your campaign, as well as your achievements and successes. Since Facebook events can only be two weeks, you can create a Facebook group after the event is over. That way, you can keep the momentum going and continue to have your team behind you to help you reach your goal! Facebook groups are best when everyone is on the same page, so be sure that you invite a small group of dedicated friends and family to help you in the final sprint. Learn how to make a Facebook group here.